Deputy Michael Ring at the announcement of National Community Day. 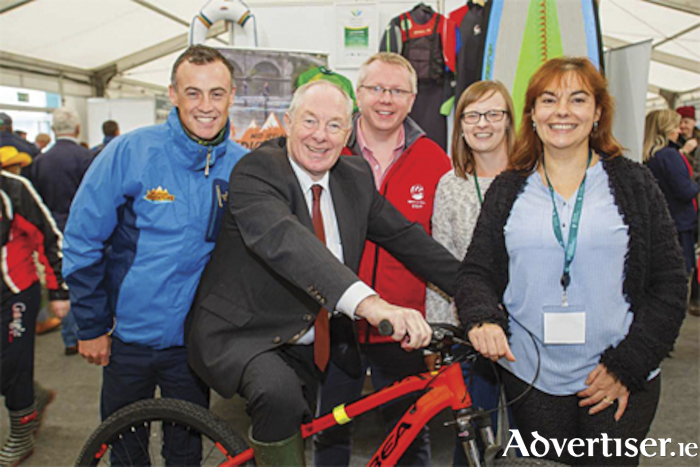 The Minister Rural and Community Development, Mr Michael Ring, TD, has announced the launch of a National Community Day, to be held for the first time on May Bank Holiday weekend 2019, urging local communities to come up with ideas for events in their areas. “National Community Day is a celebration of the great spirit of community that exists throughout the country and an effort to facilitate people who share communities to get together, get to know each other and deepen the sense of community in their area. “Events will take place over the course of the May Bank Holiday weekend as the days get longer and summer will is upon us,” Deputy Ring commented. The Deputy is encouraging local communities to derive initiatives which will help make National Community Day a success. “I invite people throughout the country to begin thinking about how they can help make National Community Day events a success for their local community. “The success of this initiative lies in having local communities decide what events are most appropriate for their area. National Community Day belongs to everyone. We don’t want to tell communities what they should do, events will be very much driven by communities. “The events could include themes around sport, history, baking, anything that will help neighbours to come together,” the Deputy added. Concluding, Deputy Ring noted that National Community Day will afford local communities the opportunity to enhance their sens of unity and purpose. “National Community Day is a chance for people to foster a sense of helping each other by coming together, not just on that day, but all year round. As our society has become a busier place, people have less time to get to know their neighbours. National Community Day will provide a structure to allow people to meet each other, have an enjoyable time at local events which are devised and driven by the community,” Deputy Ring noted.